Cuban cigars, salsa dancing, old muscle cars, neoclassic architecture, the Malecón, the Tropicana show, Hemingway’s house and the famous El Floridita bar—the birthplace of the Daiquiri! No Starbucks, no McDonald’s, no South Florida condos or obnoxious chain restaurants. An opportunity to step through time and see what 1960 looked like. Oh, and it’s only 101 nm almost directly south of Key West. That’s an hour to an hour-and-a-half flight at 110 to 160 knots. So, why not? 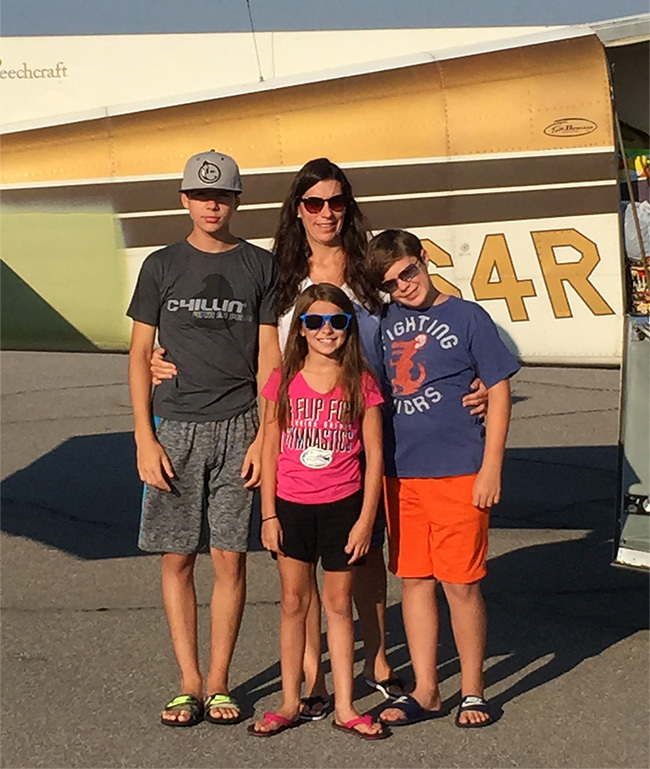 I decided to take my wife, three kids, ages 14, 12 and 10, and my 1960 D50C Twin Bonanza to Cuba over the kids’ Spring Break. We had planned to take a weeklong tour through Havana, Cienfuegos and Trinidad, with a snorkel trip to the Bay of Pigs, but President Obama’s surprise trip to Cuba forced us to redo our plans. He was scheduled to arrive on Monday of our Spring Break, and then the Rolling Stones decided to have a free concert for the Cuban people on Friday of the same week. 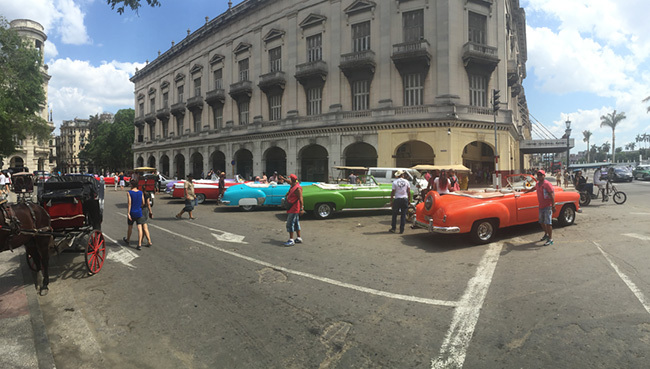 The resulting flurry of activity meant we had to settle for one day and night in Havana, but what a day and night! For those of us who have been around for a little while through decades of the economic and cultural blockade, Cuba seemed a million miles away. 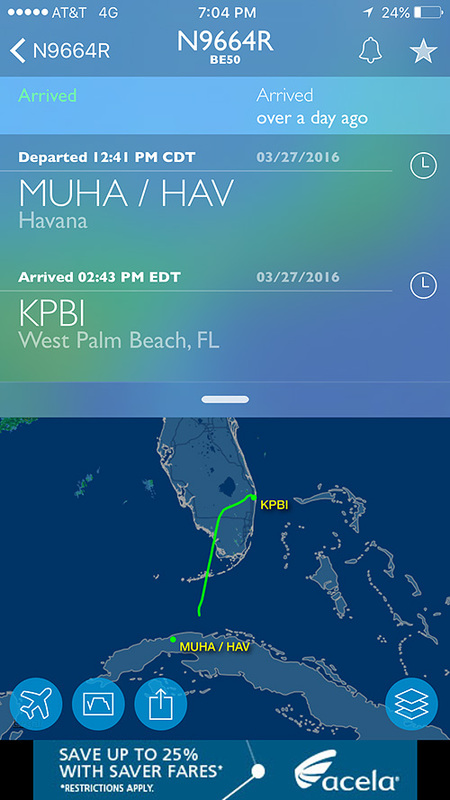 A quick look at the author’s flight plan reveals that Havana is much closer to Miami than many in-state destinations. It’s essential to have your paperwork prepared to ensure your flight to Cuba is a seamless one. File an ICAO flight plan. I used ForeFlight to file right from my iPad. File an EAPIS border crossing. I used Flash Pass to file, again, right from my iPad. 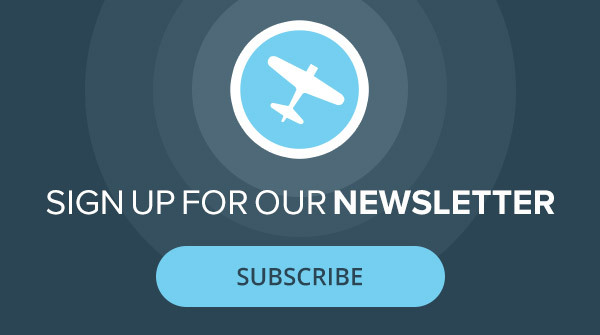 Obtain a DOT sticker for your plane (it’s only $27), which takes a week or two to arrive. Just do an online search for DOT sticker. Secure a Cuban Landing Permit. It costs $275, and you can purchase one with advance notice from Jim Parker at Caribbean Flying Adventures, caribbeanflyingadventures.com. I recommend having Jim set up a tour guide for your first trip. He can combine the landing permit and a tour for a very inexpensive fee, and it’s well worth the price. The permit is actually a 4-digit code that Jim emails to you. You just enter that code in your flight plan in the remarks section. That’s it! You can take off from any airport to get to Cuba—it doesn’t have to be a POE (Point of Entry) airport. You do have to return to a POE airport in America, and there are only four airports you can return to from Cuba. I suggest returning to the Key West Airport—that’s the easiest return flight. A sample flight plan from Marathon Airport would be MTH TADPO MUVR MUHA. You would list the crossing point as “TADPO” on your EAPIS border-crossing manifest. Carry the following items, plus a lot of water and maybe a knife and a mirror, in a duffel bag that you can grab quickly if things go south over the water. Life jackets are required; you can rent them from KFPR, St. Lucie County International Airport, Fort Pierce, Florida. A life raft—not required, but it’s a great idea to carry one. You can also rent one from KFPR. EPIBR. If you’re going to go over the water more than once, get one. You can purchase an EPIBR from Sporty’s, sportys.com/pilotshop. The takeoff and landing process is an easy one. The Jose Marti Airport has a 06/240 runway that’s 13,123 feet long and 148 feet wide. The land all around the airport is flat, and the airport is easy to spot. You’ll get handed off from the Miami controllers to the Havana controllers around TADPO, the waypoint where you cross from American to Cuban airspace. The Havana controllers all speak English and are very helpful. I had a little trouble with the accent, but they repeated everything nicely when I didn’t get it the first time. When in doubt, ask for a vector. This flight is like any other flight you might take for an hour to an hour and a half. Upon landing, the Havana controllers give you taxi instructions to a small building. There’s almost no general aviation traffic at this airport. 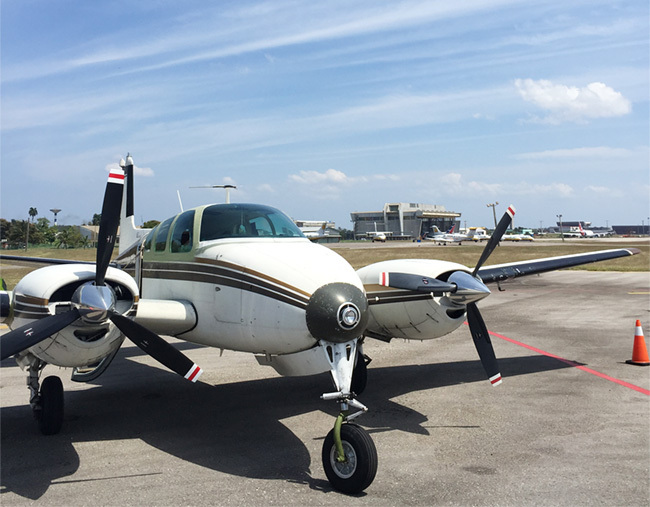 I saw a King Air from the Bahamas, an Air Commander from Venezuela and a 185 on floats, also from America, when I landed. The rest of the planes were big ! There wasn’t any traffic when I was coming in, though, and it was an easy and pleasant landing. I think any GA traffic they have is routed to this small building. This is where things get a little different. The small building is kind of like an FBO building, away from the main terminal. The difference is that there’s no “front desk”—just a room with couches and chairs. We waited in the building for about an hour while the attendant continued to disappear and then reappear with our passports. She had me fill out a lot of paperwork. They’re very serious and formal. Eventually, a man showed up, who walked us to a group of three or four airport employees, who proceeded to go through our luggage and examine everything. When they were satisfied, we were walked over to the Cubana terminal, where Jim had arranged for the tour guide to meet us. The Cubana terminal was empty and the lights were mostly out, lending a “horror-like” feeling to the terminal. Our guide’s name was Ricardo, and he was fantastic—he was very flexible about making sure we could see whatever we wanted whenever we wanted. Ricardo handed us off to a driver in the airport “FBO” parking lot (tiny, maybe three cars), who had a red 1955 Chevy. It was the coolest car I had seen in Havana up until that point. All five of us packed in, and the driver started the seven-mile trip to Havana. Another note: 1955 cars don’t have seat belts. Or air conditioning. Cars manufactured between 1950 and 1960 also have smelly exhaust. Since 70% of the cars in Cuba are circa 1950 to 1960, be prepared. There are also carts with horses and donkeys traveling on the same roads as the cars. You’ll see cars from other countries that are more modern, but not nearly as cool. And look for motorcycles with sidecars—we saw a lot of them! Our driver didn’t speak any English. Few people who we met in Cuba spoke English. On the way out of the airport, I took note of two 15-foot walls with barbed wire on top that surround the airport. It wouldn’t be easy to get in and out of that airport illegally. The walls have Socialist propaganda everywhere. I asked my son to translate one wall (he’s in his first year of middle-school Spanish), and he said it read, “Socialism or Death”. There are also buildings with images of the “esteemed leader” displayed on the sides. 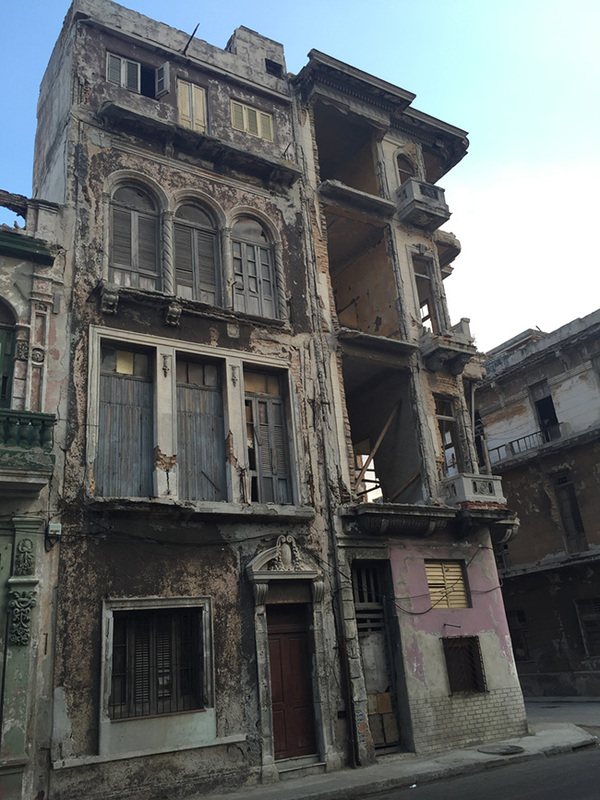 The architecture of Havana is beautiful, but much of it is in need of restoration or beyond that point. As we rode into Havana, we began to appreciate the architecture of the older buildings. All of them are made of stone, many with iron or concrete balconies, and they’re exceedingly beautiful. They’re also extremely rundown, and the roads have potholes everywhere. Havana must have been the most beautiful city in 1960. And while it doesn’t look like any maintenance has been done since then, Havana is still an absolutely fascinating destination. The cars jump out at you from everywhere. They run from the 1940s to 1959 vintage, and they’re painted vibrant Caribbean colors. They’re in good shape, not show shape, as they’re working automobiles. The cars are worth the trip by themselves. Never have I seen 15 cars waiting for a stoplight, and they’re all classics. The people are fantastic. Cuba appears to be a poor country, as nothing is maintained but the cars, but there are no panhandlers. I did see a lot of honking, and note that some drivers seemed to be aiming at pedestrians in the street. So be alert when you’re out walking! We stayed at a Casa Particular, a housing unit provided by the government. It’s someone’s home, and other guests are staying there, too. If it makes you feel better, you can call it a “bed and breakfast,” since breakfast is served. It is not the Ritz. If you’re looking for a 5-star hotel, visit another country. Hotel rooms are hard to come by, and the Casa Particular we stayed in was very nice. We had a private room and bathroom, with a lock on the bedroom door. The floors, walls and ceiling were cement, and the ceilings were 15 feet high. The living room faced the sea, and the doors opened to a spectacular view of Havana Bay. It certainly was an adequate and safe place to stay. The restaurants serve very good Cuban food and are reasonably priced. The servers aren’t fast or used to hustling for service. I get the feeling that tipping isn’t common, as they looked surprised when I handed over more cash. After we finished eating, a travel guide took us on a walking tour of the city. I’m not someone who loves museums or old churches, but I really enjoyed the tour. We stopped and got a drink at the bar at El Floridita, Hemingway’s old haunt. Our guide, a young 20-something girl, was more than happy to take us wherever we wanted to go. Be prepared for great music everywhere. In the streets, the bars, the restaurants—Cubans love music! The Tropicana show is a must if you go to Havana. It’s outside at night, and the Tropicana restaurant is very romantic. And they provide unlimited rum. It’s easy to see why the Tropicana has survived for over 75 years. The dancers carry very large objects on their heads while wearing virtually nothing. Not for kids. Incidentally, we left the kids at the room, with a babysitter Ricardo provided. The kids loved her, and she made us feel very comfortable leaving them with her. We were very relaxed as we headed back to the airport. GA traffic is rare in Cuba, and from America, virtually nonexistent. Ricardo arranged for a Cuban airport worker to walk us through the exit procedure. The airport employee actually made up “plane tickets” with my tail number on the ticket, right in front of the woman whose job it was to check them. Then he walked us through a hall where another woman checked his ID and our IDs, and we handed her the “tickets.” She looked very closely at everything. This procedure definitely was an odd one. We spent a lot of time waiting as airport workers kept coming and going, taking our passports and then leaving and returning again. Finally, an airport official I recognized from our arrival showed up, and he took us in a bus to another terminal. It looked like the main terminal used by commercial airline traffic from Europe and South America. In the first place we visited, I paid “ground handling fees.” That came to about $560 U.S., paid in cash. Based on the amount of paperwork I received, these were legitimate charges. I had already paid Ricardo $85 a person for the visas ($425). The Cuban official next took me to the flight planning office. I filed my flight plan by filling out paperwork with an older Cuban woman who didn’t speak any English. It was difficult to communicate, but she was very helpful once I gave her my pen with American writing on it. I recommend bringing a lot of little “gifts” to give away. The panic comes next. At that moment, I realized that I had forgotten to file with EAPIS—letting the U.S. border know I was coming. There’s really no way to do this easily in the Havana airport. What followed was an hour-and-a-half panic attack as I convinced the Cuban official to let me go into the big terminal and purchase an Internet card for a dollar to give me access to email. The Internet still was uncertain, but I got off an email to my brother telling him to file for me. Avoid this panic. File before you leave the U.S., or—big tip—there’s Internet access at the bar at El Floridita. File EAPIS while you have a drink there. We took the bus back from the big terminal to the “FBO,” and we were ready to leave. Remember to call the tower and ask to start your engine. This is also true in Grand Cayman, as well as some other Caribbean airports. The taxi out to the run-up area held another surprise—a Jeep with a man with a gun and another guard out near the wall. I realized the Cubans were making sure no one attempted to board the plane, should they actually make it past the two walls with barbed wire. We took off and had an uneventful flight back to the United States. When we took out our bags and went through Customs, I expected something—a demand for our itinerary, suspicious looks, something. Nope. Nada. We sailed right through. I’ve had more interest from the U.S. Customs coming back from the Bahamas. Bring lots of cash; your credit cards don’t work in Cuba. And there’s virtually no Internet. Be prepared by filing ahead of time. It costs a lot to get in and out of the country by private plane, but once in Cuba, the cost is much less than in other areas nearby that I’ve visited. Make sure you stay for a week or two. It’s not cost-effective for just a single night! Is GA travel to Cuba worth it? Absolutely! Treat yourself and travel back in time for an experience that will soon be gone! Mike Giordano is the President of United Air Temp. He began flying in May 2011 and has a private pilot’s license with instrument and multi-engine ratings. Mike has about 950 hours and is lucky enough to fly as part of his job. He currently owns a 1960 D50C Twin Bonanza. Sounds expensive! If I followed properly, minimum of $275 (landing permit) + $560 (ground handling fees) + $425 (visas) — $1,260 — plus whatever the cost of life jacket and raft rental is, and that’s before fuel and before you even get out of the airport to do/see anything! And all to finance an oppressive socialist government. I’ll pass, enjoy my cocktail on American soil, and look at pictures of Cuba on the internet. Or go to the Bahamas. Correction: A landing permit does NOT cost $275.00. This is a fee charged by Jim Parker for processing the permit request and send info to Cuban immigration.A permit can be acquired in a few hours at a very low cost. The Cuban Civil Aviation are very efficient and fast responding to all requests. Immigration information filing is done once the 4 digit permit number is acquired. Can you do this on a VFR aircraft? Mike’s recount is dated. I just returned from another trip and things are markedly different. For instance, the “Cuban Landing Permit” is free; all fees are dealt with at what Mike calls the “FBO”, (Terminal 5); the $560.00 handling fee for an overnight is exorbitant and the clearing proceedings before departure are totally unknown to me. In short, Mike’s experience does not resemble mine. I am disappointed in reading this article which seems to promote GA tourism to Cuba without any restrictions. The US still maintains an embargo on Cuba. Travel to Cuba for tourist activities remains prohibited by statute. There are, however, 12 categories of authorized travel. The Department of Treasury’s Office of Foreign Assets Control (OFAC) has issued general licenses in all 12 categories of authorized travel, subject to appropriate conditions. This means that individuals must meet the regulatory conditions of the respective general license they seek to travel under. Your article fails to mention that US persons must travel under one of these 12 categories. Travel for the purpose of tourism is prohibited. The author mentions his initial intention of traveling to Cuba for snorkeling which constitutes a prohibited activity. The author also encourages pilots to visit for 2 weeks. The author fails to mention that US regulations prohibit a US aircraft from remaining no more than 7 days unless the pilot has obtained a US Department of Commerce – BIS license. I have traveled three times to Cuba and led a small group of GA pilots to Havana and we complied with all the restrictive regulations. Your article unfortunately seems to portray that traveling to Cuba is as easy as flying to the Bahamas. It is not ! Really enjoyed the article and your insight. Could you provide a better break down of the expenses I could expect for such a trip? Any issues with obtaining 100LL in Cuba and did you have to pay cash for the fuel? What were the restrictions on returning to the US with “souvenirs” (Cuban Cigars, etc.)? Just return from Cuba with a group of 22 Twin Cessna. You cannot fly to Cuba without a Landing Permit. It is not free! You can get the permit and the Immigration Services for as low as 100$. 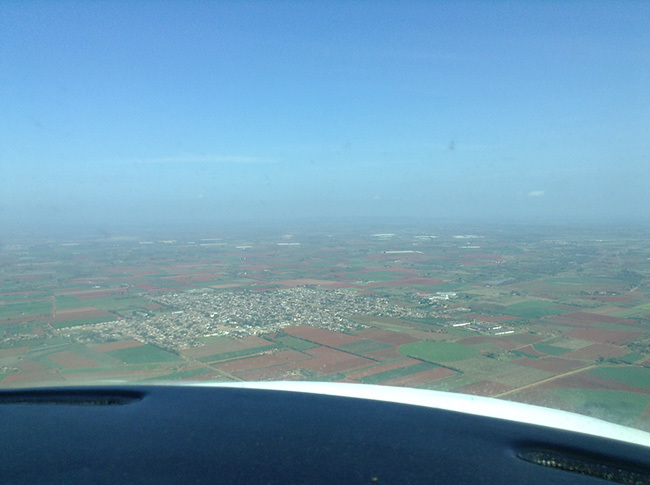 As far as VFR there a trip organize in October under a very special condition. It will be AirRally. Cuba is definitely different than the Bahamas. And it is more expensive than the Bahamas for private aviation but still less expensive than buying four charter tickets to Havana. However, your trip to Cuba will be a once in a lifetime opportunity to experience the remarkably rich culture and history of a previously isolated island nation only 90 nm from the Florida Keys. And yes, there are Cuban and U.S. rules to be aware of, no question. And they are changing almost monthly. I appreciate Mike’s comments about the service provided by Caribbean Flying Adventures. We have provided landing permits and ground arrangements for over 200 aircraft since June 2015 and are the lowest cost provider by far in the industry. We are also totally up-to-date with Cuban and U.S. regs. There are very, very few private or commercial pilots who could on their own obtain the landing permit, notify Cuban customs of their arrival, notify Cuban handlers of their arrival, comply with U.S. and Cuba regs and procedures, pull together a comprehensive checklist of arrival and departure procedures, find the Cuban SIDS and STARS, know about fuel availability or even where to taxi after landing in Havana, know how to obtain a Cuban tourist card/visa, currency exchange, accommodations, what to do, guides, etc. etc. Anyone that tells you as a first time visitor to Cuba in a private aircraft that it is a piece of cake it not someone you want to listen to. I have been to Cuban 15 times since May 2015 in a C172RG and have flown into seven different Cuban airports. It is definitely doable. It is a trip you will never forget. Thank you very much for talking this way about my country, I am Ricardo de Cuba and I am happy to have been one of the causes that you are exprecen this way about my country, thank you one more time and hope to see you around here soon. 1. Sumbit at least 24 hours before departure. Sometimes CBP is slow with email confirmations. 2. Submit your inbound manifest at the same time you submit the outbound. Some Islands have spotty internet service and it is best to send it ahead of time. It is easy to make a change by phone directly to CBP with a manifest in the system. Great information. Are you allowed to hop from airport to airport. There are many small airports on the island. I just returned from Holguin and Gibara on the east end of the island. As a note, I have been to Cuba many times and have never seen one of the old American cars with the original engine. Most have diesel Russian tank engines.